Have you ever visited someone’s home and been completely in awe of their beautiful gardens, outside sitting areas, landscaping? Did you think to yourself, “I wish my home could look like this.”? Make your wishes come true with a bit of planning, guidance and vision. What a difference a beautifully landscaped area makes. It shows warmth, hospitality and pride in one’s home. We update our houses with new fixtures, countertops and furniture, yet often neglect updating our 20-year-old outside décor—shrubs, trees and plantings. What a statement it makes to have someone visit and to be greeted by lovely landscapes and enjoy a dinner on the deck with vibrant and eye-catching surroundings. 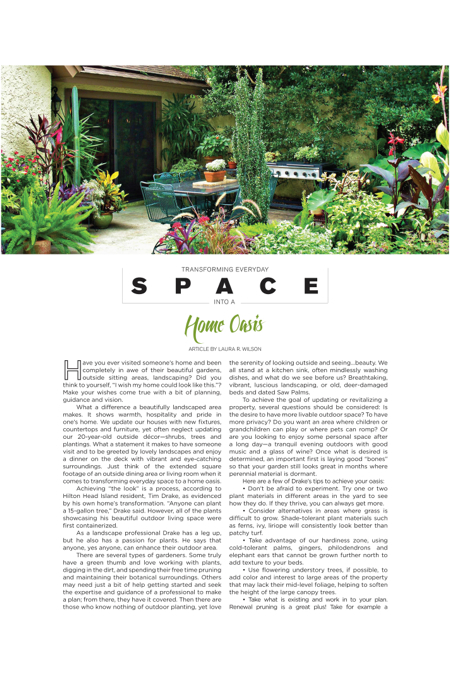 Just think of the extended square footage of an outside dining area or living room when it comes to transforming everyday space to a home oasis. Achieving “the look” is a process, according to Hilton Head Island resident, Tim Drake, as evidenced by his own home’s transformation. “Anyone can plant a 15-gallon tree,” Drake said. However, all of the plants showcasing his beautiful outdoor living space were first containerized. As a landscape professional Drake has a leg up, but he also has a passion for plants. He says that anyone, yes anyone, can enhance their outdoor area. There are several types of gardeners. Some truly have a green thumb and love working with plants, digging in the dirt, and spending their free time pruning and maintaining their botanical surroundings. Others may need just a bit of help getting started and seek the expertise and guidance of a professional to make a plan; from there, they have it covered. Then there are those who know nothing of outdoor planting, yet love the serenity of looking outside and seeing…beauty. We all stand at a kitchen sink, often mindlessly washing dishes, and what do we see before us? Breathtaking, vibrant, luscious landscaping, or old, deer-damaged beds and dated Saw Palms. To achieve the goal of updating or revitalizing a property, several questions should be considered: Is the desire to have more livable outdoor space? To have more privacy? Do you want an area where children or grandchildren can play or where pets can romp? Or are you looking to enjoy some personal space after a long day—a tranquil evening outdoors with good music and a glass of wine? Once what is desired is determined, an important first is laying good “bones” so that your garden still looks great in months where perennial material is dormant. • Don’t be afraid to experiment. Try one or two plant materials in different areas in the yard to see how they do. If they thrive, you can always get more. • Consider alternatives in areas where grass is difficult to grow. Shade-tolerant plant materials such as ferns, ivy, liriope will consistently look better than patchy turf. 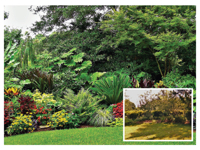 • Take advantage of our hardiness zone, using cold-tolerant palms, gingers, philodendrons and elephant ears that cannot be grown further north to add texture to your beds. 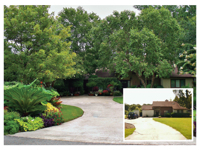 • Use flowering understory trees, if possible, to add color and interest to large areas of the property that may lack their mid-level foliage, helping to soften the height of the large canopy trees. • Take what is existing and work in to your plan. Renewal pruning is a great plus! Take for example a 30-year-old Ligustrum which can grow to a height of 30 feet. Cutting back plants to 18 or 24 inches in late winter when the energy is in the root system allows a plant to have the energy to flush out vigorously within weeks. • Mow down old perennials to add compost and give the soil and plant area its own shredded leaves as fertilizer. • Add color with seasonal pots and/or variegated plants. For areas that are subject to damage by deer, the Foxtail Fern is shade-tolerant and sun-tolerant and brings vibrant variations of greens to the beds. Clerodendrum is a great shade shrub that deer won’t eat. • Add and subtract: Put in what you like and see if it works, because you can always subtract. Tim Drake is a business developer and landscape enhancement designer for The Greenery, Inc. For more information or a landscape consultation, contact Drake at (843) 384-5963.